Investment in real estate securities and real estate investment trusts (REITs) have been seen as a diversifying opportunity to a well-balanced portfolio and one that can generate income. REITs, given that they own or operate real estate assets and typically generate income, can offer benefits of both income and capital appreciation in a portfolio. However, despite the benefits, REITs can also be correlated to equity and fixed income markets, due to their exposure (and dependence) on both. In particular, REITs can be highly sensitive to interest rate changes. It can be observed that, over the short-term, prices of REITs may be inversely correlated to interest rate yields [FIGURE 1]. Diversification does not ensure profit or protect against loss in a positive or declining market. P/NAV is an industry standard metric that shows valuation levels in real estate. Correlation is a statistical measure of how two securities move in relation to each other. Leverage. Many REITs are levered, and thus depend on debt to boost returns. As the cost of servicing the debt rises, the income generating potential is diminished. Rising rates. More importantly, even REITs that have low leverage can still be affected by rising rates or inflation. This is because not only are bonds impacted by rising interest rates, but, in fact, all bond-like instruments are impacted. That is, any instrument with an up-front capital cost and fixed dividends with no adjustment for growth or inflation will see a drop in value in a rising rate environment. Real estate fits this category very well, as the cost of properties is typically paid up front, and although lease amounts can be adjusted, the landlord’s ability to adjust the rent is proportional to lease length, which may be several years long. Because of a combination of these reasons, REITs can be hit in a rising interest rate or inflationary environment. Can any REIT lessen the impact? So how does one find opportunities in the REIT space that mitigate the effects of interest rates or inflation? We believe that AACA’s real estate strategy seeks such investment opportunity. Broadly speaking, AACA’s investment philosophy is centered on seeking investments where the landlord has leverage over tenants. This leverage manifests itself via more favorable lease terms for the landlord, and such investments by their nature have fewer of the characteristics previously mentioned. Past performance is not indicative of future results. There is no guarantee that any investment will achieve its objectives, generate profits or avoid losses. 1 Dividend yield is only one component of REIT returns, along with the dividend growth rate and capital appreciation. In this example, we use them interchangeably as the yield is a large component of returns. 2 Source: Public company filings. 3 Source: SNL Financial. Monopolistic characteristics. For example, there are only three companies that have cellular tower networks. Competition is light in this subsector, especially when compared to the residential leasing subsector, which has hundreds of residential apartment providers. Barriers to participant entry. A cell tower start-up would need to have the infrastructure, capital, and technological know-how to build 60,000 new cellular towers. By contrast, most anyone with a pick-up truck and an easily obtainable construction license can build apartments in Texas. Barriers to tenant exit. The largest wireless phone provider has a strong marketing campaign based on the strength and reliability of their network. We believe that they are unlikely to switch tower providers for marginal lease savings, especially if it puts their reliability (and reputation) at risk. Secular tailwinds/demand drivers. Consumers are voraciously data-hungry; Cisco recently did an analysis and estimated that data consumption in the US will increase 20% year-over-year for the next five years.4 Increasingly, consumers are using their mobile devices to consume this data, which subsequently increases demand for data centers. In contrast, residential apartments typically grow in the long term at about the US economic growth rate of 2%-3%. In addition to those mentioned, there are multiple sub-sectors within real estate that meet most or all of these characteristics, such as infrastructure, gaming, and ski resort companies, that can help to lessen the effect of interest rate rises. Overall, current prices in the real estate sector present an opportunity that has historically favored investors. A key metric, price/net asset value (or P/NAV), has historically shown marked cyclicality. 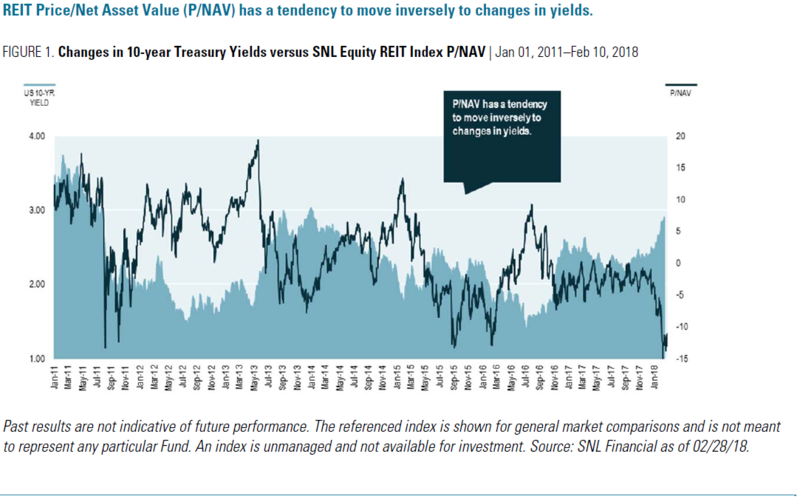 When P/NAV of the SNL Equity REIT Index has been low, subsequent returns have historically been positive [FIGURE 2]. More specifically, the forward six-month returns of the REIT Index were positive 90% of the time during these discounted periods [FIGURE 3]. 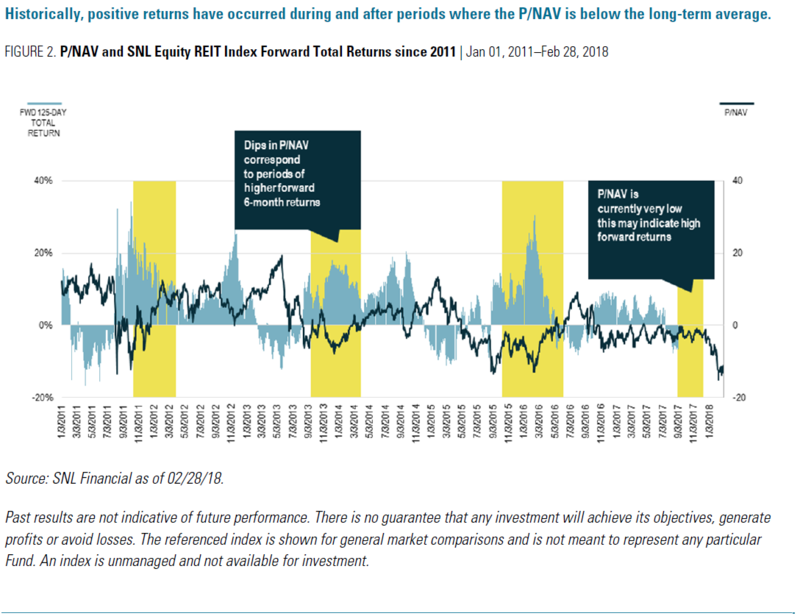 Alternatively, when P/NAV has been high, subsequent returns have been mixed—some have been positive (57% of the time), while others were negative (43% of the time). 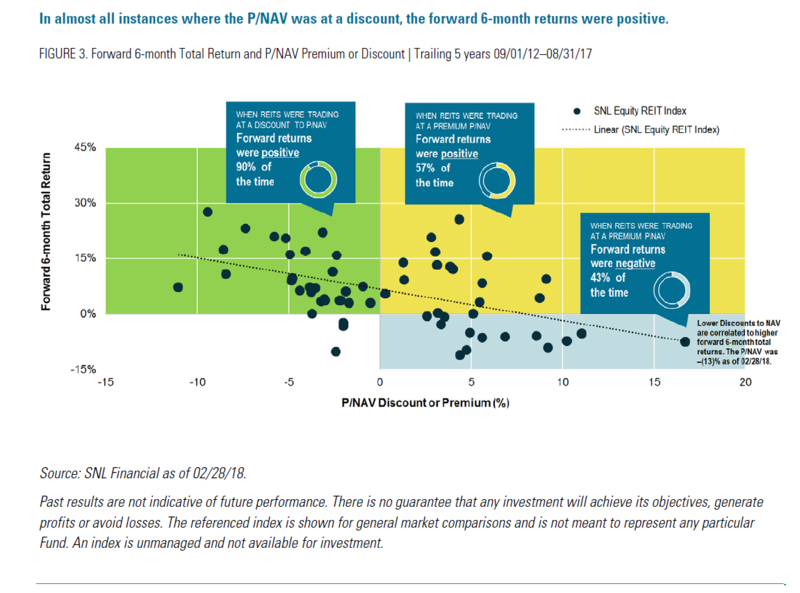 Although this is no guarantee of future performance, all else being equal, we believe it to be prudent to invest in REITs when they are trading at a discount P/NAV. The unique, growth-oriented and inflation-protected characteristics of real estate investments exhibiting the qualities discussed above may prove to be useful in a rising rate environment. Furthermore, the current discount within the real estate sector has proven beneficial in the past to investors who have purchased at these lower P/NAV valuations. SNL Equity REIT Index. A market capitalization-weighted index that included all U.S. domiciled publicly traded (NYSE, NYSE MKT, NASDAQ, OTC) Equity REITs in SNL’s coverage universe. KEY RISKS: Stock market risk—stock prices may decline; Industry risk—adverse real estate conditions may cause declines; Interest rate risk—prices may decline if rates rise.